Dixon is closing today due to a gas leak that was discovered in the building. Bennett Elementary School will dismiss at 11:15 a.m. today, October 18, 2018 due to a power outage. DETROIT – (Oct. 9, 2018) The Detroit Public Schools Community District (DPSCD) announced today its long-term solution to provide clean drinking water for the more than 50,000 students and staff throughout the District with the installation of water hydration systems. In addition, the District announced support from approximately a dozen philanthropic partners who have committed $2.4 million to support the purchase and installation of the hydration systems to be placed in every school building by summer of 2019. DPSCD will be one of the nation’s largest public school districts with hydration stations in all school buildings. The hydration stations offer filtration technology designed to cool water and remove lead, copper and other contaminants. The District will install one station for every 100 students as well as one in every gym and faculty lounge. The DPSCD Board of Education unanimously approved the implementation and funding of hydration stations in all DPSCD schools today during a special board meeting. 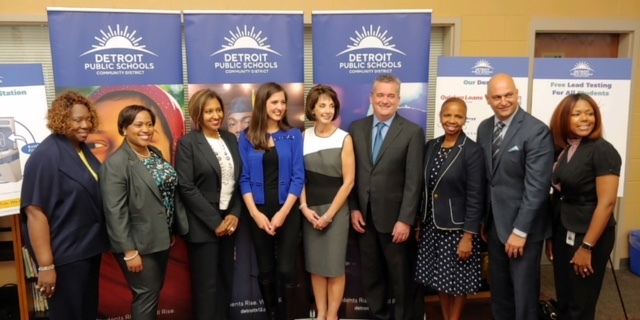 Dr. Taylor also commented on the strong collaboration that has taken place between DPSCD, the Detroit Federation of Teachers, the Detroit Health Department, the Detroit Department of Water and Sewerage, as well as countless parents and community members. Superintendent Vitti also announced an initial list of donors who committed funding for the hydration stations. The total purchase and installation cost are expected to total nearly $3 million. The Financial Review Commission will hold a special meeting later this week to approve any outstanding financial obligations incurred by the District. The United Way for Southeastern Michigan is spearheading the philanthropic campaign with a lead gift of $500,000. They are also working to raise additional funds from the community through a dedicated website link at www.UnitedWayWaterFund.org. Other major donors include: Quicken Loans ($500,000), the Delta Dental Foundation ($300,000), DTE Energy Foundation ($300,000) General Motors ($200,000), Ford Motor Company Fund ($200,000), FCA Foundation ($100,000), Blue Cross Blue Shield of Michigan/Blue Care Network ($100,000), Ascension Michigan ($50,000), the Detroit Medical Center ($50,000), Health Alliance Plan/Henry Ford Health System ($50,000), The Jewish Fund ($25,000) and an anonymous donor ($10,000). (see attached list). Until the hydration stations are installed, schools will continue to use water coolers. Once the stations are operational, the water coolers will be removed. Similar hydration stations are being used in multiple districts around the country, as well as locally in Royal Oak, Ann Arbor and Birmingham schools, suburban school districts in Michigan. DPSCD’s continued commitment to provide updates and information to the community will be shared in a series of letters that will be distributed today throughout the District and the City (see attached). Included in this packet is a letter from the Detroit Health Department. Western and Earhart will be dismissed at 12:30 p.m. today due to power outage. Western International High School and Earhart Elementary-Middle School will be dismissed today (9/20) at 12:30 p.m. due to a power outage. ATTN: Carleton will release early today, Sept. 6, at 12:30 p.m.
Carleton Elementary will release students early today, Sept. 6, at 12:30 p.m.
Nolan is closed today, September 6, due to power loss.